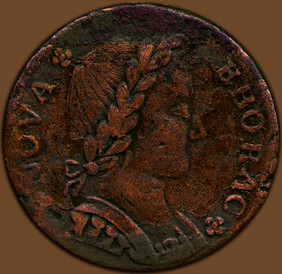 This week's Featured Web Page is an introduction to the Nova Eborac Coppers from the University of Notre Dame Colonial Coins site. In March of 1787 the New York State Assembly took a stance restricting the circulation of lightweight coppers and rejecting all the petitions they had requested for permission to mint coppers. The two majors contenders for the minting rights took matters into their own hands. Thomas Machin and his partnership concluded an agreement with the Vermont mint and also began producing imitation British halfpence. The other major contender for the New York contract was the partnership of Ephraim Brasher and John Bailey. Brasher and Bailey also took matters into their own hands by privately minting Nova Eborac coppers (Nova Eborac being the Latin for New York). The coins were made to look like contemporary British and Connecticut coppers with an obverse portrait of a mailed bust facing right and wearing a laureal wreath with the legend "NOVA EBORAC." The reverse contained a seated figure of Liberty holding a branch in one hand and a liberty pole in the other with a shield below, similar to Britannia, with the legend "VIRT. ET LIB." (Virtue and Liberty) and the date 1787 in exergue. These coins were accepted and regularly used for they are usually found in well circulated condition. Their weight range is from 88 - 150 grains.